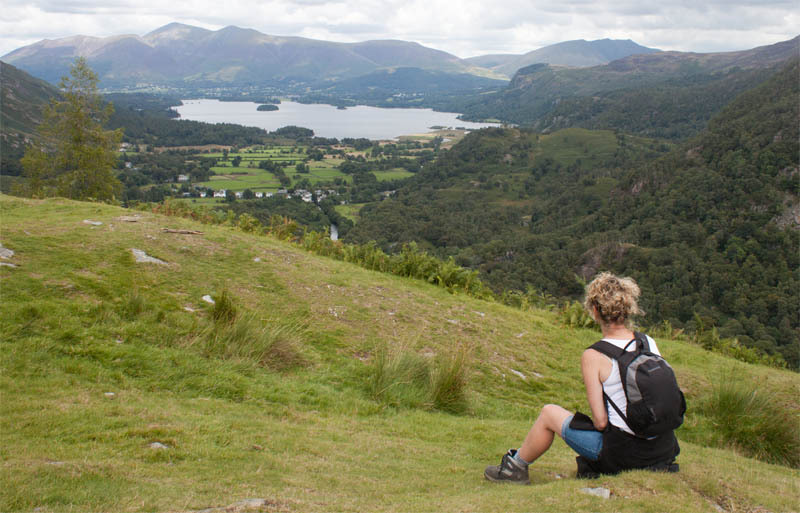 Maps: Sheet OL4: The English Lakes: North Western Area. Start: NY251197 - High Brandelhow pier, we travelled from Keswick to the start of the walk via the Keswick launch. Finish: NY254274 - We returned by catching the bus from Grange Bridge (Stagecoach service 78). 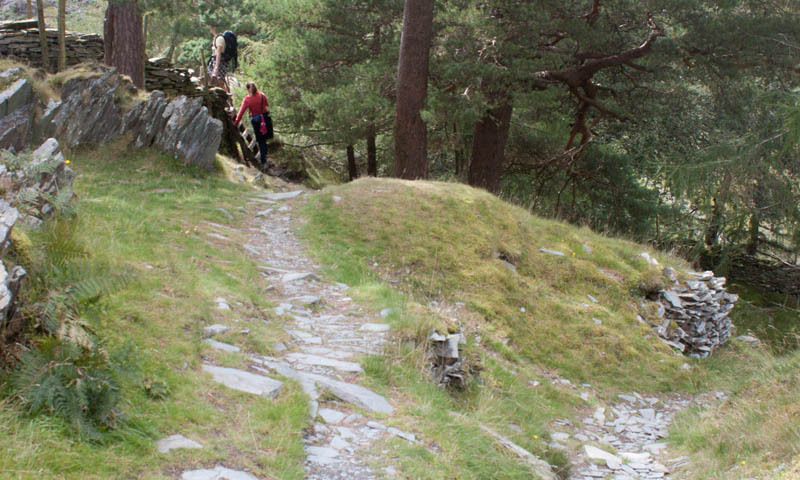 Route: There is a very steep climb and an even steeper descent. 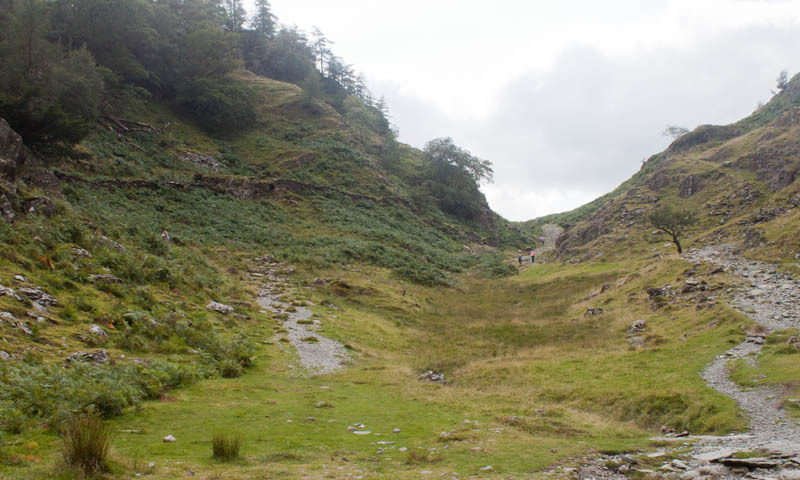 The steepest part of the route is over a loose slate spoil heap with almost sheer drops - not a walk for the fainthearted. 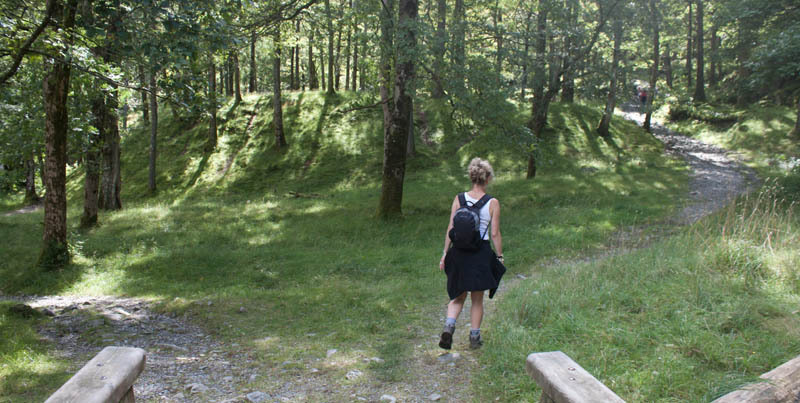 The remainder of the walk follows clear tracks. 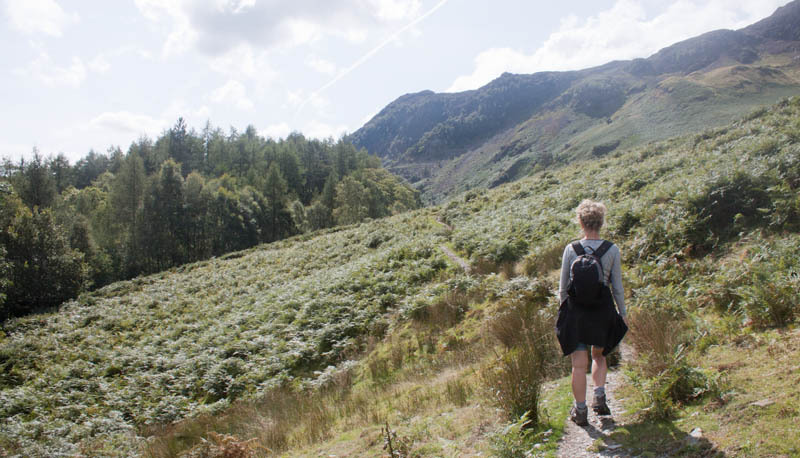 It can easily be shortened by walking to Rossthwaite to catch the bus, or extended by either walking to Seatoller for the bus or to Lodore for the ferry - or even walking all the way back to Keswick. 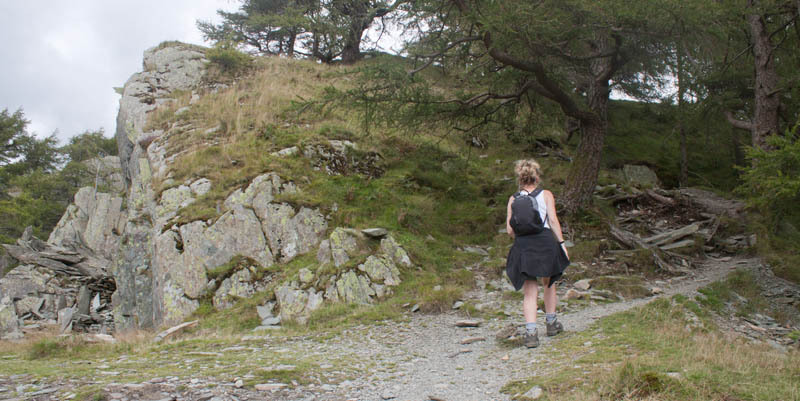 There is plenty of choice in Keswick (though our favourite is the Square Orange). 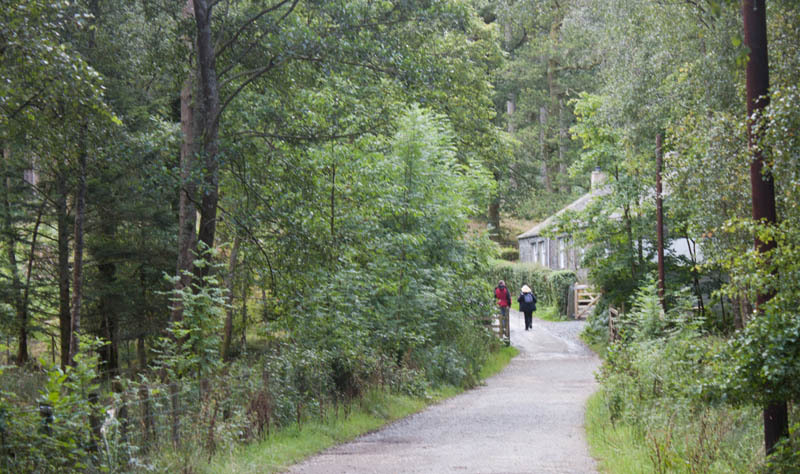 As the ferry leaves the landing stage walk up the path bearing left into woodland. 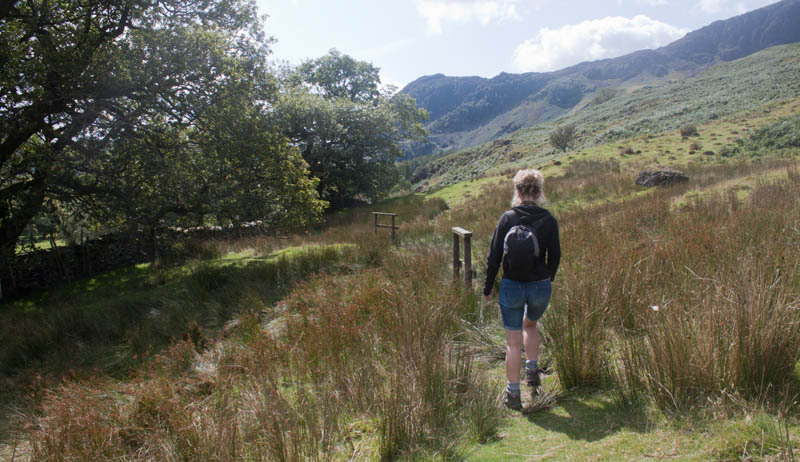 … or turn left to follow the shore line for a short distance before re-joining the main path. 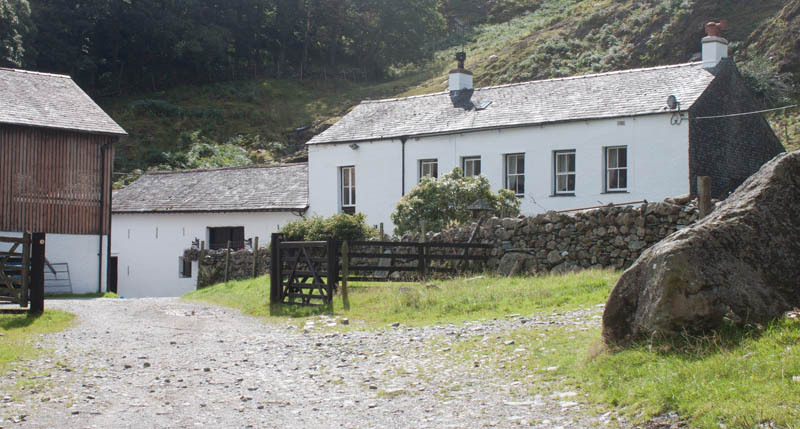 … passing the cottage shown in the picture. Where the path forks, continue straight ahead. 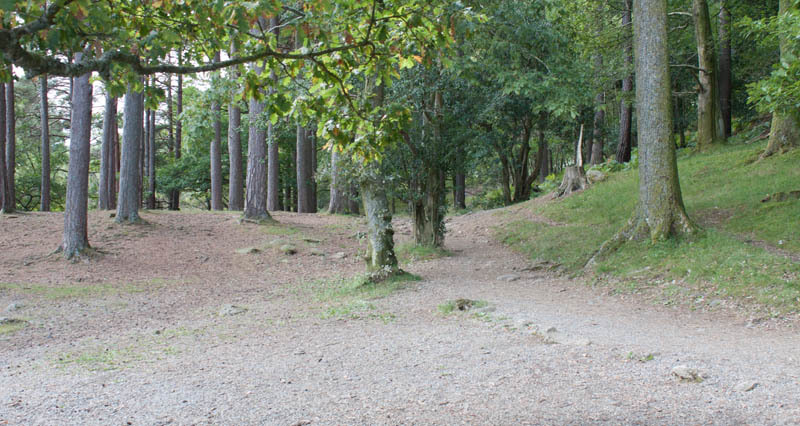 The path winds round to the west and then joins a minor road. Turn left onto the road. Where two footpaths meet the road on the right hand side, take the one heading south west, signposted for Grange. 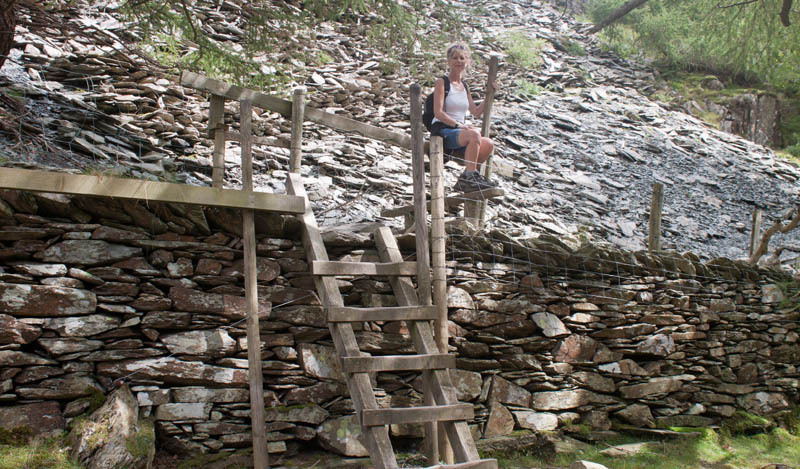 Climb the narrow stile to follow the narrow path through woodland. 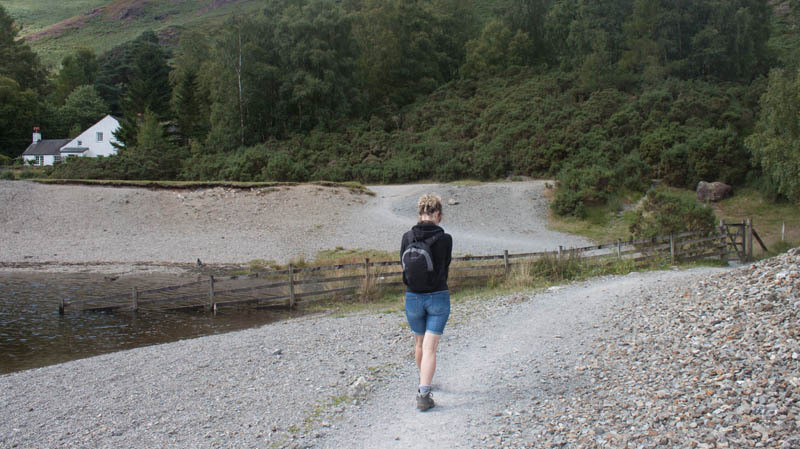 … and then you need to cross a wider stream with no bridge! 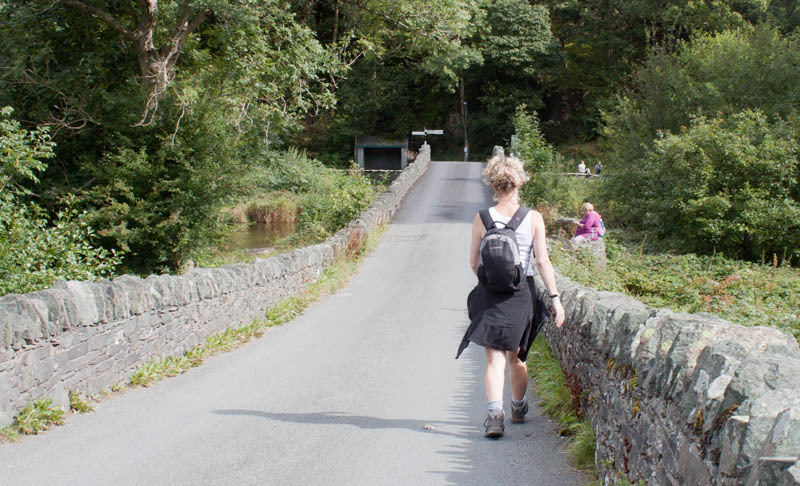 … before leading across a more substantial footbridge. Cross the bridge and follow the path alongside the wall. … round to the left. 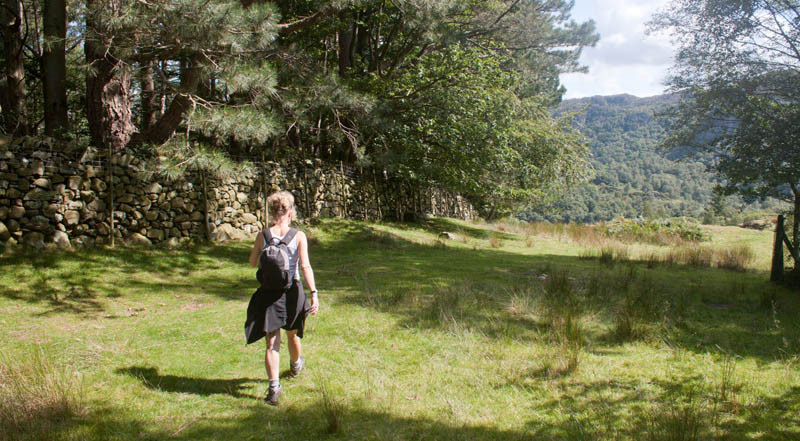 Walk down the grassy slope to pick up a stony track. 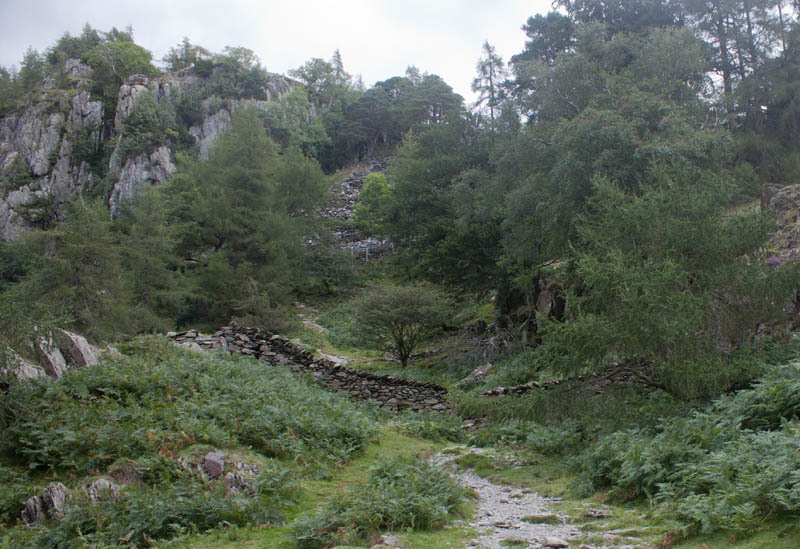 … with Castle Crag now directly ahead. … before bearing right to join another track leading south. Pass by fields used for camping. At the junction of tracks shown in the picture bear left, passing a metal barrier saying, "Agricultural Access." 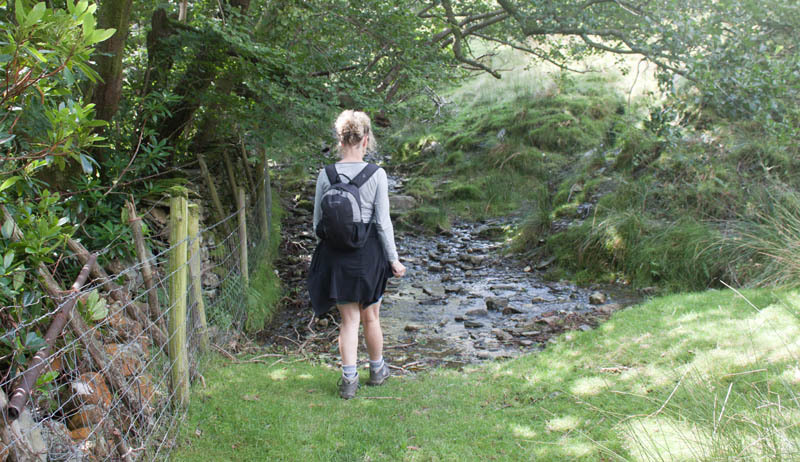 The track widens where a stream joins the river. 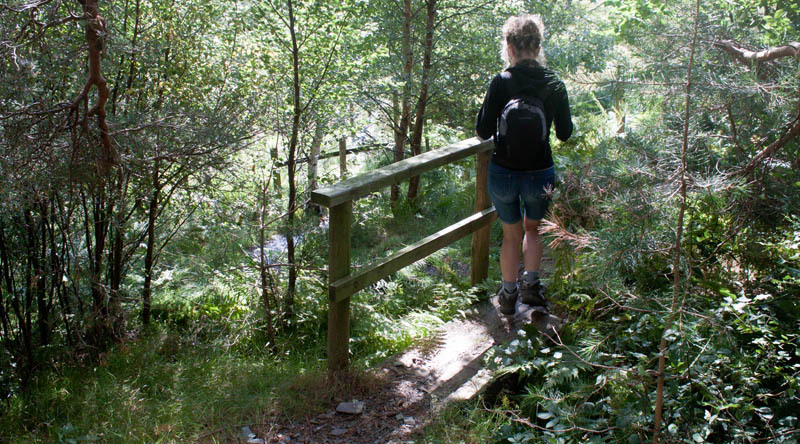 Cross the stream by the footbridge and follow the right hand path. 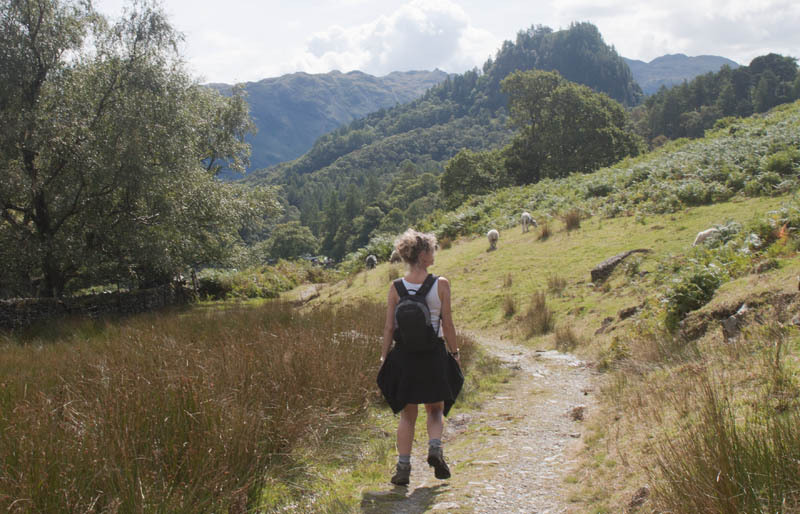 At a junction of tracks, turn left to follow a stony track which climbs gradually between Castle Crag on you left and Goat Crag on your right. Follow the narrow path branches to the left from the main track. 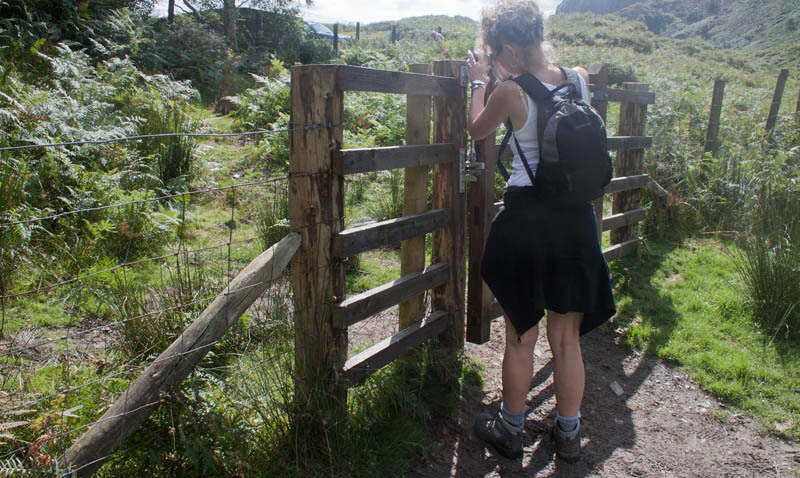 … and then to this wooden stile. 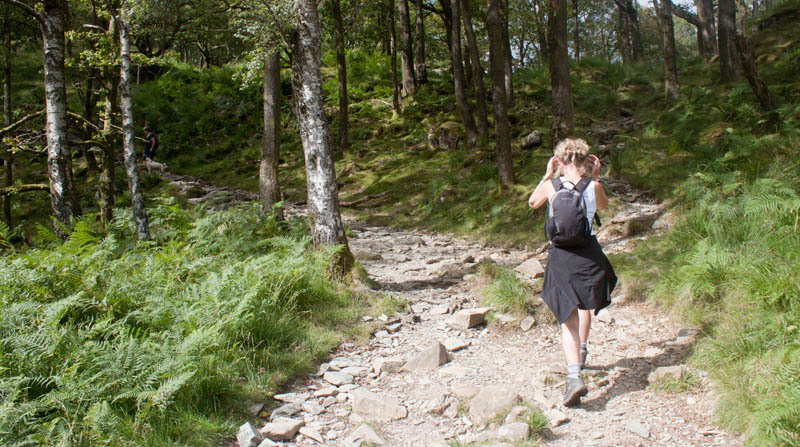 It's from this point that the path becomes really steep - in places more of a scramble! 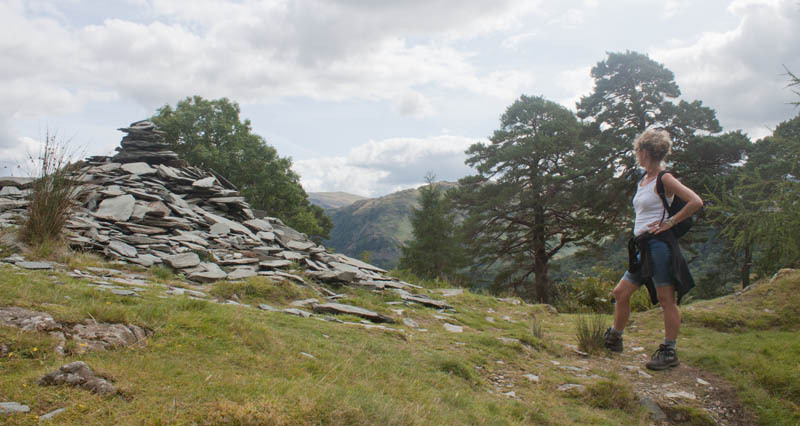 And the climb isn't over when you reach this cairn! 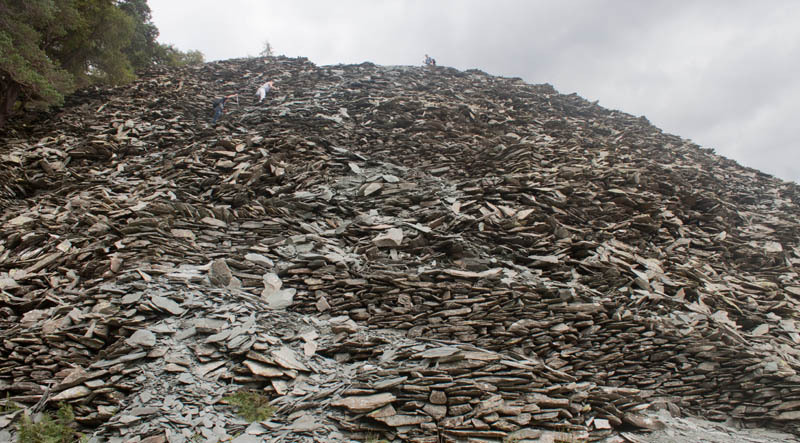 The next part of the route is a precarious route zig-zagging up this slate spoil heap. 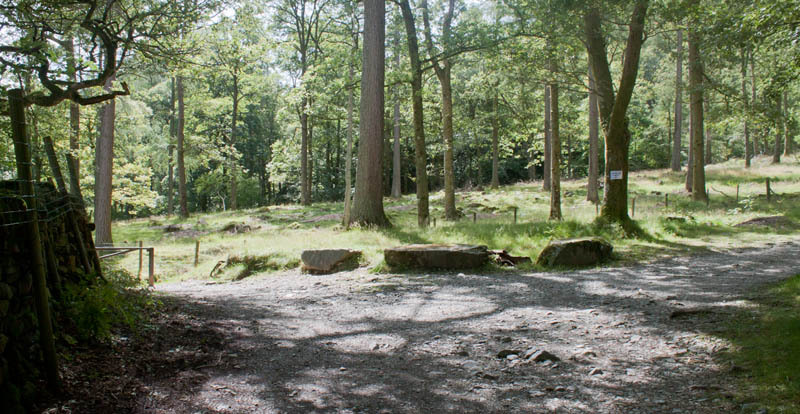 At the top of the spoil the entry to the disused quarry is on the left whilst the path to the summit is on the right. The top is marked by a cairn on top of the rock outcrop. 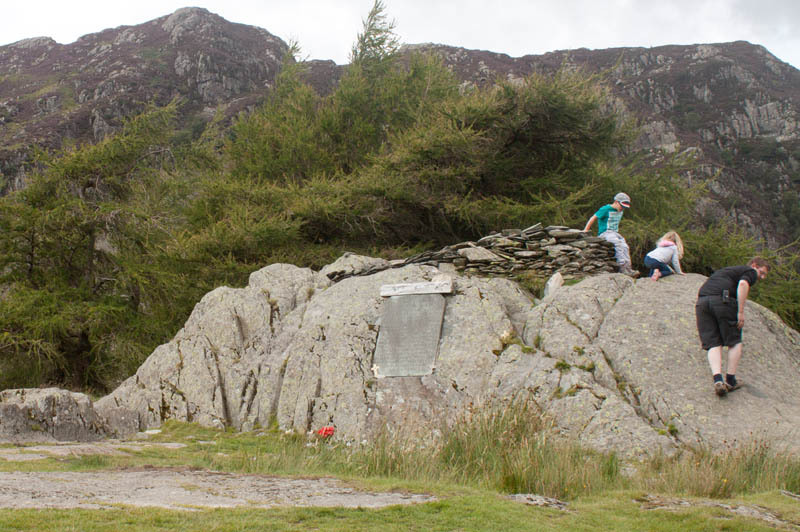 Attached to the outcrop there is a memorial to the men of Borrowdale who were killed in World War 1. When you have admired the splendid views to the north (pictured) and south, return down the steep path to the foot of the spoil heap. 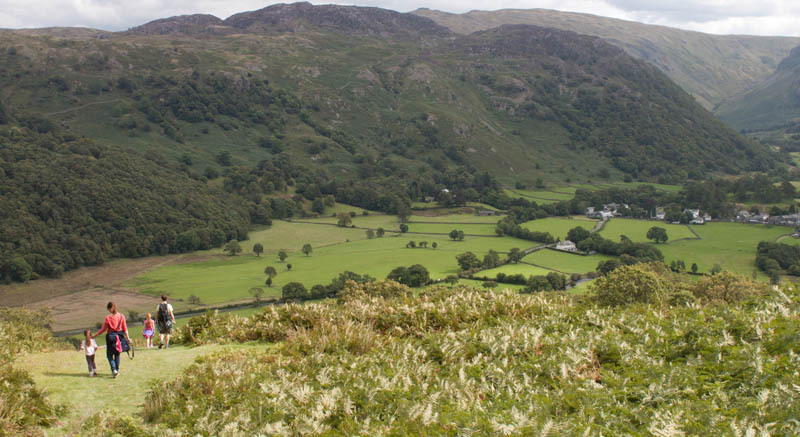 … the hill, with views along the Borrowdale valley towards Rossthwaite and beyond. 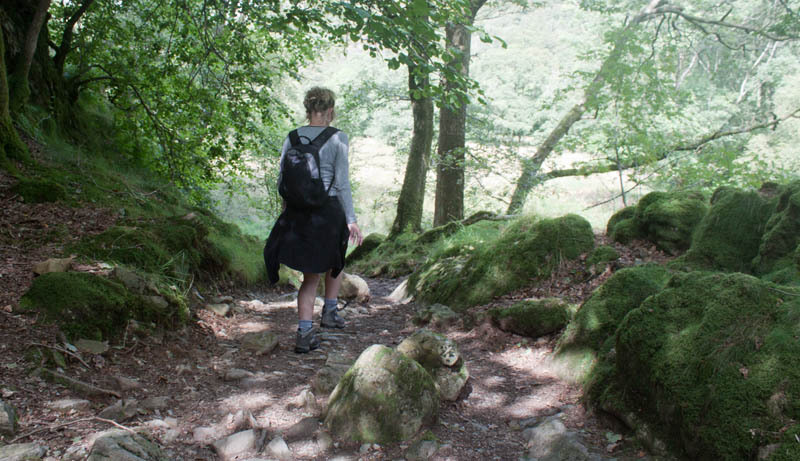 At the foot of this path you have a choice of routes. 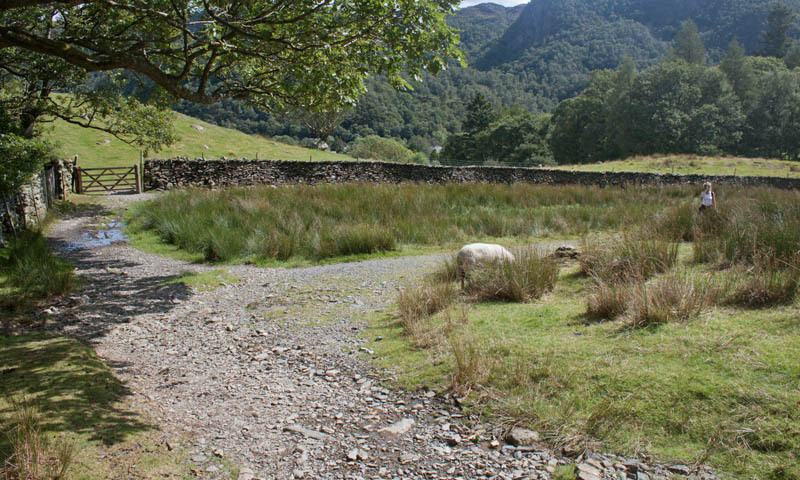 Turn right if you wish to shorten the walk and catch the bus at Rossthwaite or left to continue the walk to Grange. … until you reach the junction shown in the picture. The narrower track on the right cuts off a corner. 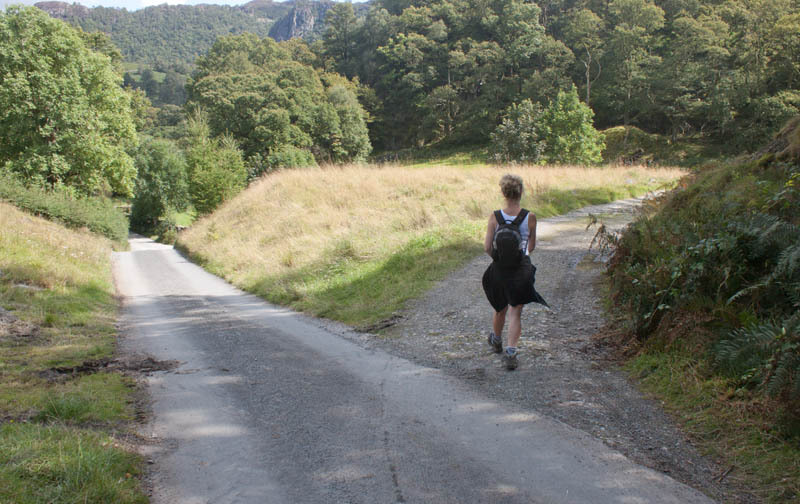 However the paths re-join, so it doesn't matter which you take! 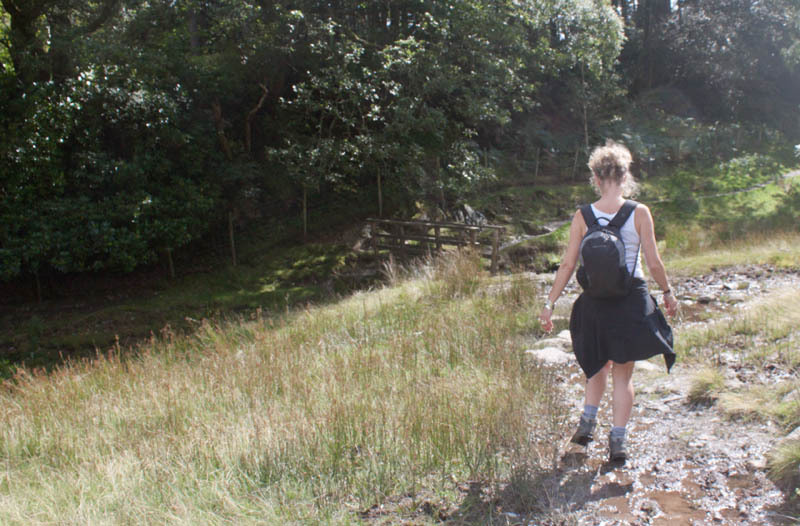 … to where the path divides. 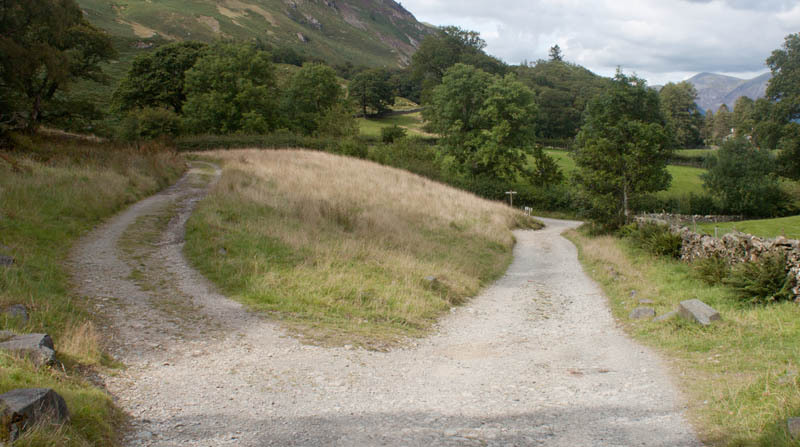 Take the right and fork and then turn right, following the sign for Grange. 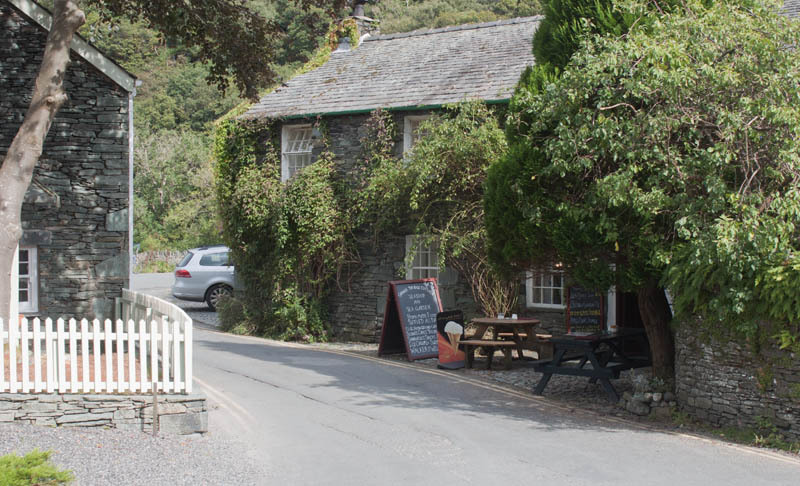 … passing (or stopping for refreshment at) Grange Café or Grange Bridge Teashop. Cross the bridges and the bus stop is on your right. 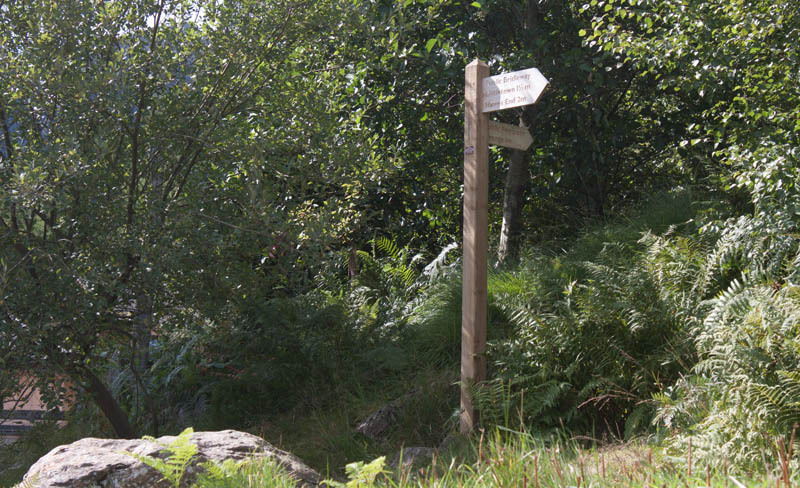 If you wish to extend the walk and return to Keswick by the launch, turn left. 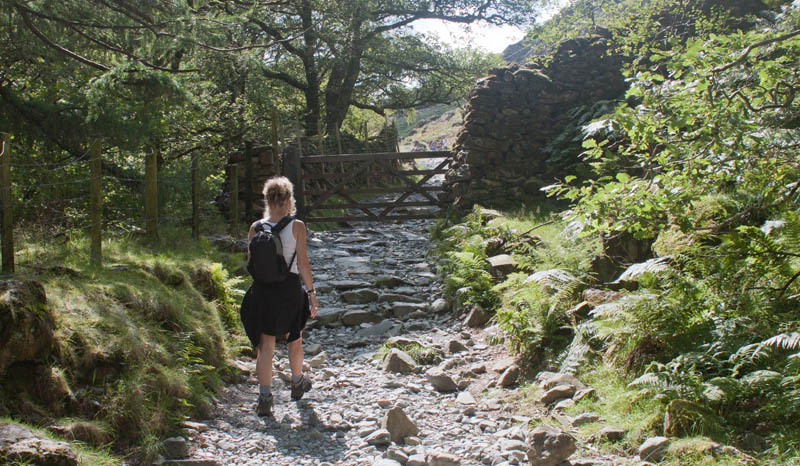 Follow the road until you reach Lodore Falls Hotel. 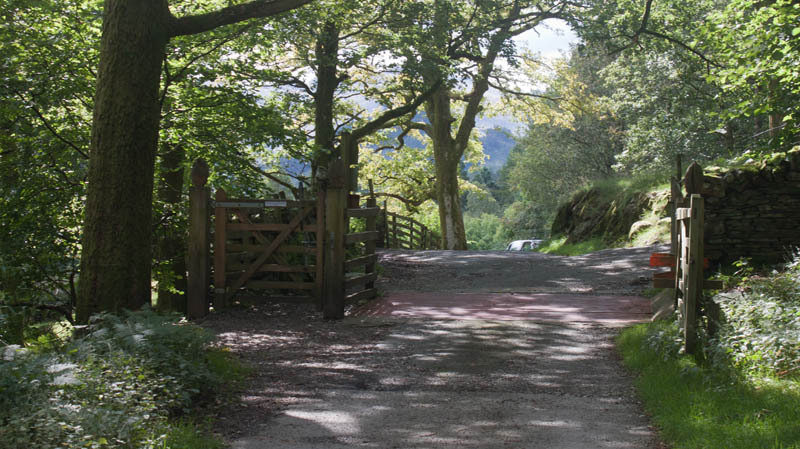 Just beyond the hotel, go through a kissing gate on the left and follow the path to the landing stage. 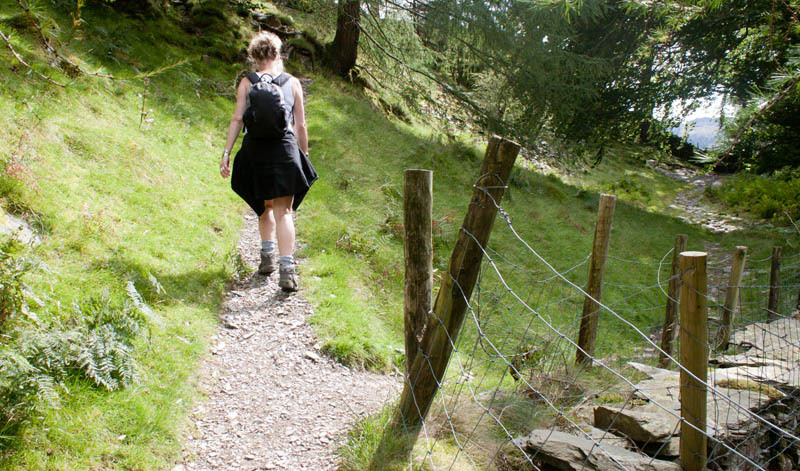 If you are feeling particularly energetic, there are footpaths which run close to the road for most of the way back to Keswick. 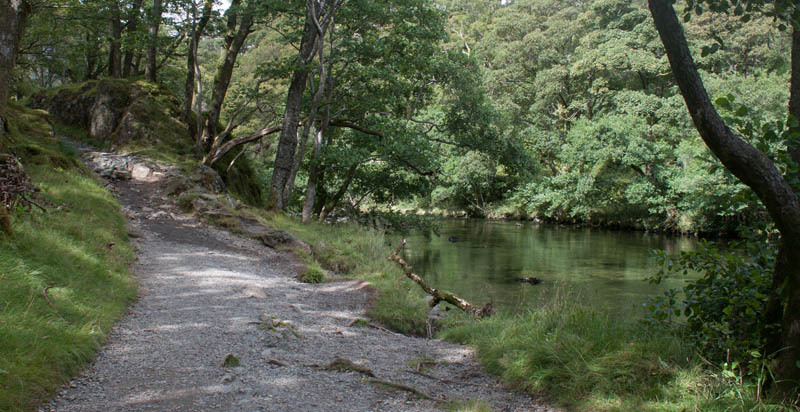 The first of these is to the right of the road, just beyond the Lodore Falls Hotel. 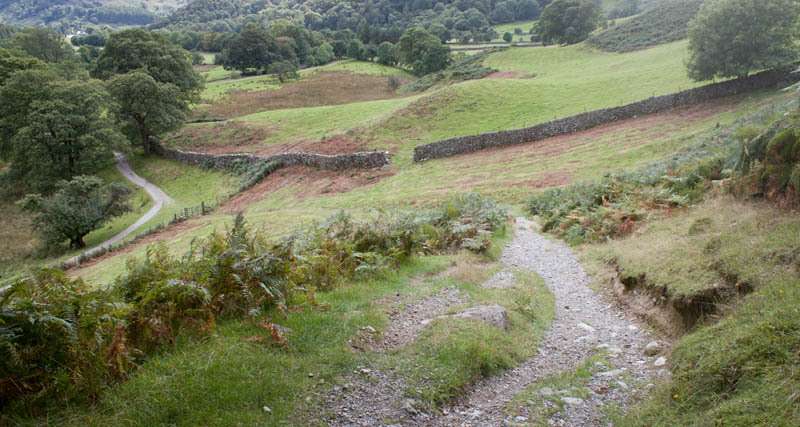 When this path re-joins the road, walk along for a couple of hundred yards, then look out for a path on your left. This follows the lake shore more closely than the road. 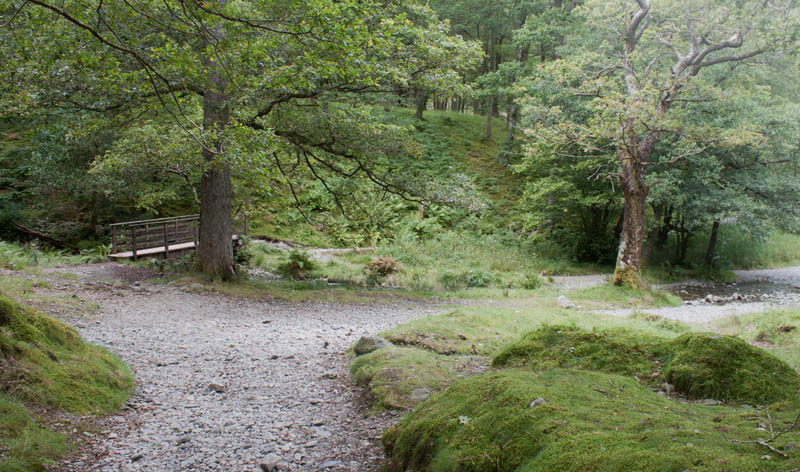 At a junction of paths near the Ings, you can turn left to walk through a small area of woodland and following the shore path back to the landing stages, or carry straight on to re-join the road back to Keswick. All text and images ©Graham Dean, September 2014.